At WGS, you will find a remarkable golf shoes sale for every player – men, women and juniors. You can get European and US sizes in three width choices. Choose from a selection that ranges from the traditional saddle shoe to the trendy hi-top and colors to fit every mood. Therefore, WGS is your choice for the best selection in golf shoes. WGS is an authorized dealer for all major golf shoe brands; including: Adidas, Biion, Cuater, Ecco, Footjoy, GFore, New Balance, Nike, Olukai, Skechers, and Under Armour. Furthermore, golf shoes are the foundation for your stance and one of the most important, and often over looked, pieces of golf equipment you can own. The ideal golf shoe delivers comfort and stability. Get a shoe that provides both! The golf swing features a lot of moving parts and requires a great deal of balance during back swing, impact, and follow through. Golf shoes are designed with stability features. These will keep you on point and accurate when playing. When you step onto the course, you want to be ready to play at your highest level. It doesn’t matter whether you’re playing for fun with a few buddies or competing in your local club tournament. You always want to play at the best of your ability. Consequently, to play at your best, you need a good pair of golf shoes to give you the traction and stability necessary. This will keep your swing powerful and accurate. Find the best men’s golf shoes for the guaranteed lowest prices at WGS. Moreover, every golfer knows that a swing starts in your feet. If your feet aren’t firmly rooted on the ground during your downswing, your accuracy and power will be lost. 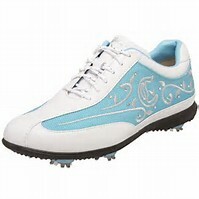 Therefore, to get the most out of your swing, you need a quality pair of golf shoes that provide the necessary traction. Additionally, quality golf shoes will be comfortable enough for you to play happily over 18 walking holes. They will keep your feet uninjured and your mind free to focus on your play. Overall: Shoes aren’t an accessory, they’re a crucial piece of equipment! Most important, if you’re looking for a great pair of golf shoes that provide plenty of traction and stability to optimize your swing, check out the FootJoy DNA. 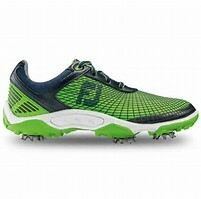 These golf shoes live up to the FootJoy reputation for cutting-edge design, quality, and reliability. They feature the SnugFit tongue, which ensures superb fit and comfort. MicroVent technology allows for optimal breathability, keeping your feet cool and comfortable. So if you’re looking for an extremely lightweight and easy to maneuver pair of golf shoes, you should take a look at the Nike FI Bermuda. This shoe has a flexible design, which gives you comfort and freedom of movement both on and off of the course. The design is optimized with breathable mesh. It offers enhanced ventilation to keep you cool and comfortable. Also, it features Lunarlon foam cushioning to support your feet and help absorb impact. Consequently, the spikeless rubber outsole gives you plenty of traction, without taking away from the lightweight feel of the design. In brief, golf shoes range from water resistant to waterproof with appropriate warranties. If you’re a dew sweeper and play a lot of golf in the morning, get a pair of golf shoes that carry a two-year waterproof warranty. If you want to get the best wear possible out of your golf shoes, buy a shoe constructed from high quality leather for long lasting comfort. You have no need for golf shoes that don’t fit properly causing blisters and calluses on your feet. Nor do you want golf shoes that squeak when you walk on the course upsetting your playing partners. Step up today and purchase a fine pair of golf shoes from WGS‘ Online Superstore! There you will find a huge selection of shoes for every golfer – men, women and juniors. They have European and US sizes with four width choices. A great selection that ranges from the traditional saddle shoe to the trendy hi-top and thirteen different colors to fit your every mood. WGS is your first choice for the best golf shoes sale. Also available for purchase are golf shoe accessories such as: spikes, laces, socks, shoe bags and shoe care. Wow, golf shoes are a LOT nicer looking than they used to be! My son golfs, but has never worn a golf shoe. I don’t think he likes the look, you know, the dorky look. LOL But these look more like an athletic shoe. I think he would love the first pair. I am going see what he thinks! Do you know if they run on the wide side? He prefers shoes that are wide. Thank you for your comments. Yes, golf shoes do come in wide sizes. The golf shoe that looks more like an athletic shoe (a sneaker) is your son’s best bet. Get him to pick out a nice pair. Golf shoes are a lot better for traction than sneakers especially if the grass is a little moist or wet.